Raven lady is participating in the Osoyoos Oyster Festival this weekend! It’s been an oyster plethora, as we’ve been tasting oysters from around the world along with our good friends from Effingham. Our offering to the festival being our signature smoked oyster topped with blue cheese and pickled onion on a cracker. 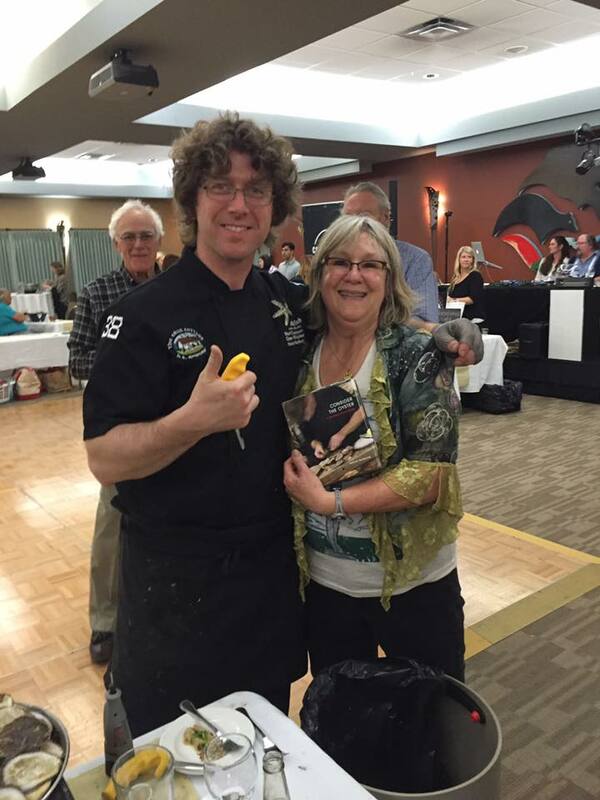 Monique’s pictured below with world champion shucker Patrick McMurray, a.k.a “Shucker Paddy”, & his signature shuckers knife. It was a privledge to meet ‘Shucker Paddy’. He is a man who fell in love with an oyster and like all great love affairs it has lead him, as all muses do to fulfill his destiny. A world champion shucker as the fastest shucker in the world at 38 shucked oysters in one minute, and author with his book Consider the Oyster. It was a pleasure to meet him and recognize that ones passion can change the world through doing what one loves!